WHY is a successful career woman in the 21st century compelled to dress like Doris Day – and produce a mannequin wedding exhibiting full-on bridal mayhem – as a means to define herself in today’s society? This question, combined with Suzanne Heintz’s bold use of satire, is what first drew filmmakers Karen Whitehead (Dir) and Katherine Wilkins De Francis (Prod) to Heintz’s brand of art activism. We came of age in London at an iconic time, when women were shaking up the image of a male-dominated business, political, and cultural landscape. Margaret Thatcher was Prime Minister; Anita Roddick founded the Body Shop; comedian Jo Brand was killing the stand-up circuit; singer Annie Lennox topped the charts; columnist Julie Burchill was daring us with her radical commentary, and Vivienne Westwood established herself as the archetype of punk fashion. With this as our cultural backdrop – art, music and fashion played an important role, becoming a window into the politics of our time. Vivienne Westwood said: “My clothes have an identity. They have a character and a purpose. That’s why they become classics. Because they keep on telling a story. They are still telling it.” Like Westwood, Heintz communicates a narrative through the use of evocative costume, with colors, patterns, and textures that are a reminder of a time we thought had long been left behind. At the core of our fascination with Heintz’s body of work (Life Once Removed stills and Playing House film shorts), is our identification with her role as a woman using visual art for social change. Whitehead and Heintz met in 2014 on a panel at an event exploring women artists as innovators and cultural leaders (She Crossed the Line, presented by Redline art centre, Denver, Colorado). The provocative statements Heintz makes through her fake family fit well in to the tradition of women artists, who were energized by the women’s movement of the 1970s and 1980s – encouraged to challenge the status quo in the art world and beyond. 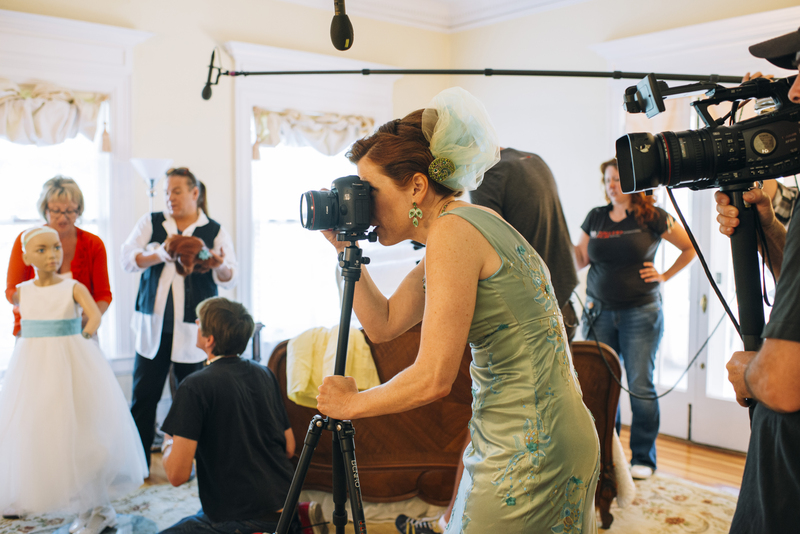 Fifteen years in the making, Heintz’s body of work references a picture perfect image of life, family and women’s roles that belong to 1950s TV family stereotypes, such as Ozzie and Harriet and Leave It to Beaver. Ozzie and Harriet may be dead, but clearly what Heintz is doing is disturbingly still relevant. Almost daily we find evidence of the disconnect between how women are portrayed on-screen and their real life experiences. This is backed up by countless statistics and reports published between 2012-2014 from organisations such as UNESCO and Geena Davis Institute on Gender in Media. Judging from the increasing number of Heintz’s online followers, and continuing global media interest (incl. China and South Korea), Heintz is attracting the attention she craves to get the conversation flowing. We are interested in observing the evolution of Heintz’s work in the online space, and seeing how public interaction begins to change the narrative. Despite growing up on the opposite side of the Atlantic (Heintz grew up in New York) – what connects us to Heintz is that we listened to the same soundtrack “at full volume” and believed there were no limits to what we could do or what we could become. We both got our starts in the film and media business, in London, at a time when gender equality became part of our DNA. One of the things that distinguishes our points of view, is that the three of us lead very different personal lives today: one is single; one is married with children; and one is married with dogs. The result is a powerful unity surrounding the image, along with our passion for telling women’s stories that are outside the mainstream. 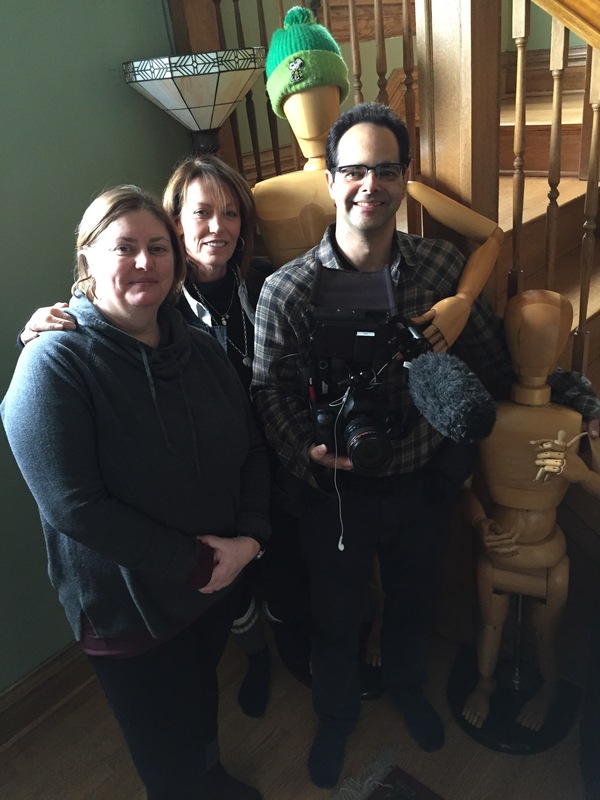 Filmmakers Karen Whitehead, Katherine Wilkins De Francis & cinematographer, Pierre Kattar pre film shoot gathering in Heintz’s hallway … with unusual production assistants!